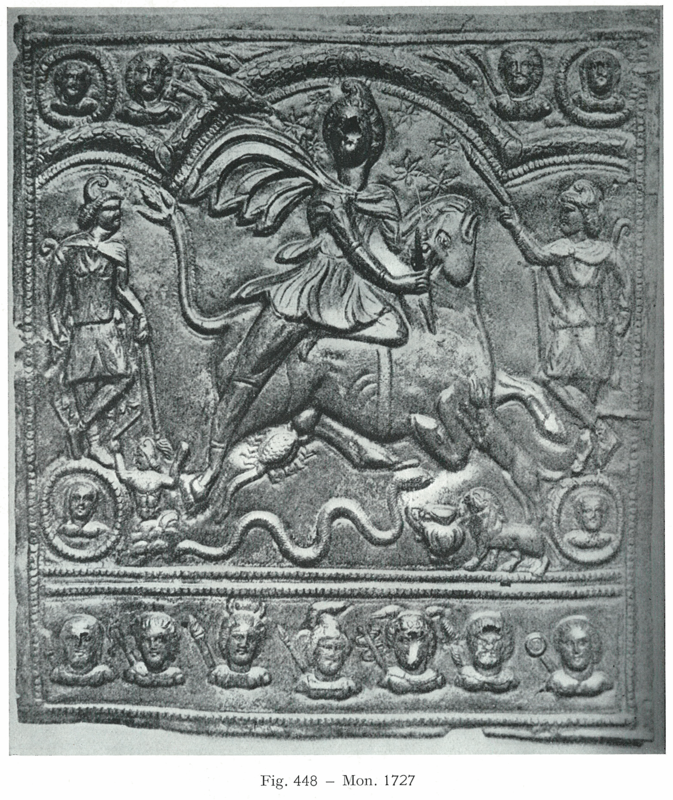 CIMRM 1727 - Bronze plate. Brigetio, Hungary. From: Google Plus. By Julianna Lees, 2007. National Museum Budapest - Lapidarium. 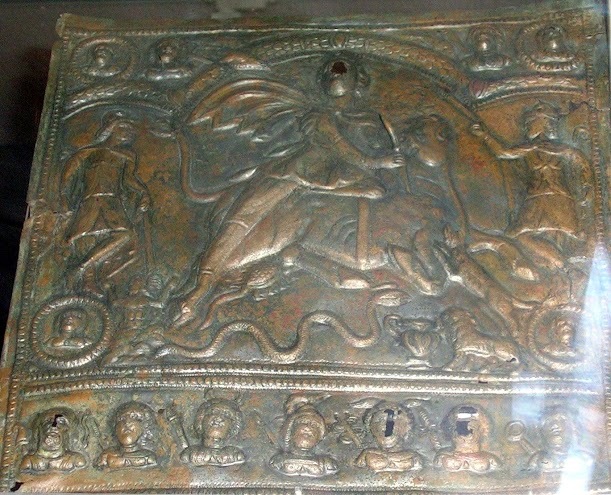 Bronze plate (H. 0.327 Br. 0.301 weight 333,8 gr.) found near the back wall. Budapest, Magyar Nemzeti Muzeum. Radnoti, 148ff and Pls. XXIII-XXIV. I am grateful to A. Radnoti for the photograph reproduced in fig. 448. In the four corners are small holes to attach the monument by. The grotto is divided into one large niche in the centre and two small arches on the sides. The border of the grotto is decorated with laurel-leaves which in five places are fastened to the grotto by means of ribbons. Upon the central arch the raven is represented, perched upon a stick (probably a ray of Sol); two small daggers with points downwards are visible on the garland. In the centre Mithras as a bullkiller. The bull wears a belt and his tail ends in three corn-ears. The dog and the scorpion in the usual places. Behind the god\'s head, which is partly damaged, there are seven stars in the field. Below the bull are the serpent, a kantharus and a walking lion. In the smaller niches and on either side of the central scene is a cross-legged torchbearer. Both have a pedum in their l. hands. Underneath Cautopates (l) Mithras with uplifted hands is being born from the rock. Outside the border the bust of Sol (l) with a whip and of Luna (r) with a torch behind the shoulders. In the corners four other busts are represented in a medallion: in the upper corners a young man (r) = Spring; a dressed woman (l) = Winter; in the bottom corners a woman (l) = Summer; a Man (r) = Autumn. Below these scenes and separated from them by two horizontal lines are the busts of the seven planets with their attributes. L. to r.: Saturnus with falx - Sol with whip - Luna with torch and crescent - Mars in helmet and in cuirass with lance - Mercury with caduceus - Jupiter with lightning - Venus with mirror.